Love the brief flurry and fury of colour in autumn before winter comes knocking at the door. Nikon D500 with Nikkor 16-80mm kit zoom. PS CC 2019 and Nik Efex. 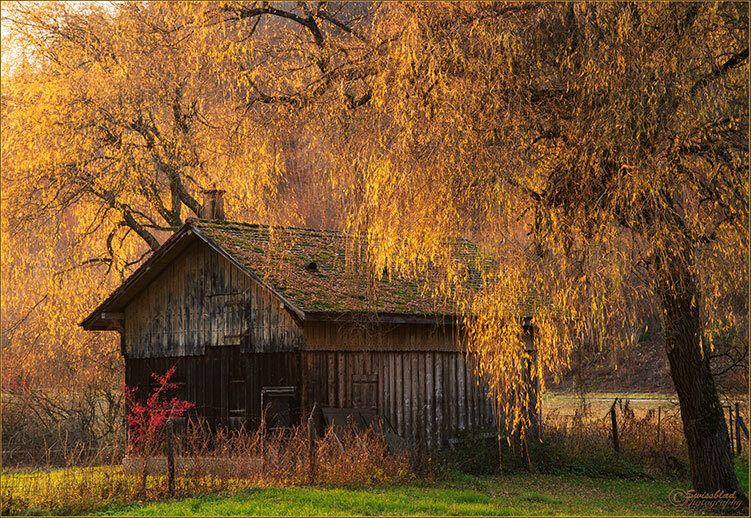 What an evocative mood you've created with the beautiful fall foliage, lovely light and dark barn- it all comes together beautifully. The larger version is a "must see"-everything just glows and the details show up nicely. Thanks for sharing this last moment of fall....winter has come here-we call it "stick season". Very moody/evocative. Love the colors and textures you’ve captured. All the elements come together so beautifully here, Sinuhe. The rustic building, the trees in their autumn golds and red, and the wonderful light filtering through the delicate branches to illuminate the scene so magically. What a pleasure to view! I love it! Wonderful composition with a perfect color harmony. Great colors throughout. The image tells a story. Thanks for the kind comments, folks - much appreciated! Thank you for the EP accolade - honoured to be selected - and many thanks for this forum!